There’s nothing quite like a day at the beach. People go for a variety of reasons: get a tan, take a swim (well, on the East Coast more than the West Coast north of SoCal… unless you look good in a wetsuit), watch whales, feel and smell the salt air… And, for some people, it’s an opportunity to mine for hidden treasure. You’ve seen these guys. Typically well-covered, daring the sun to penetrate their layers of protection. Oblivious to others because their eyes are focused on a dial and their ears are covered by headphones. 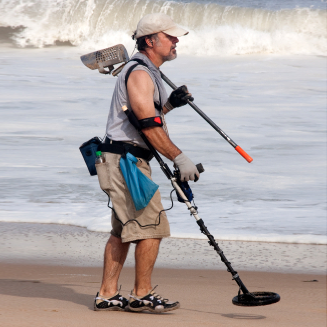 They wander around the beach, waving their metal detectors around in search of a signal. A signal suggests there’s something of interest under the sand. It doesn’t say what it is, just that it’s worth investigating. Too many false reports and you’ll probably be dialing down the sensitivity. Once you get a “hit,” you dig in and take a look at what you’ve got. It may be immediately obvious: a bottle cap, a soda can, a coin, a piece of jewelry… Classifying them into broad categories is easy, and you might have multiple bags for different things, some of which you’ll toss in the recycling when you get to the trash can (as opposed to dropping it back onto the beach, right? ); others you need to take home for further analysis. Once at home, you can go through, for instance, the coins. What country are they from? Which denominations? In what year was it minted? Those take more time, patience, and focused light than you might have out on the beach. So you spend the energy doing this after you’ve isolated that small number of items that you find potentially interesting. This is a process of detect-review-classify. And it very much resembles what you all do in a silicon fab (and not because of, or perhaps not only because of, the prevalence of silicon). ICs are expensive to make, and if there’s going to be a problem, you want to catch it early for two reasons: if the thing is too badly screwed up, there’s no reason to invest more processing (or you can try to redo the step if possible); and finding such a problem early can help you to identify equipment issues early, so you don’t send more good wafers after bad. Wafer inspection has evolved into this three-step process due to an abiding need to keep the process flowing, meaning high throughput, while getting accurate, reliable indications of problems afoot. You could certainly devise a process that would, all in one step, find, identify, and classify all defects. Problem is, it would run too slowly. It’s like digging up every square inch of beach to see if there’s anything of interest. And with each new process node, this becomes successively more ridiculous to attempt. Both KLA-Tencor (KT) and Applied Materials (AMAT – yes, I’m being lazy) trotted out new equipment at Semicon West last month. We looked at AMAT’s new selective doped n-epi capabilities already; the rest of the announcements were related to inspection. KT announced a new detection system, the 2910 series, and a new review system, the eDR-7100. Both are aimed at the 28-nm node and below, into the 1x-nm realm. The 2910 is optical; the 7100 is e-beam (or SEM). It’s theoretically possible to detect defects with an e-beam system, but it doesn’t do so well with things like color contrast, which means having to narrow the electron beam to catch edges better, which means more scans to get through a wafer. You also need lots of photons (in an optical system) or electrons (in an e-beam system) to get a strong signal, but, unlike photons, which get along pretty well with each other, electrons aren’t so mutually friendly. They repel each other, widening what you’re trying to keep as a tight beam. All of which is why they do detection optically. Also, for clarification, the 2910 is for inspecting patterned wafers, not bare wafers (which, in the KT world, use the Surfscan system). Because this system is simply looking for defect signals, not specific defects, there are a variety of algorithms that can be put to use. These are under the control of the fab as they apply a specific recipe to a specific wafer. Aperture size is one variable (like the f-stop in a camera); additional aperture settings in the 2910 are intended to allow optimization of the detection of different kinds of defects. They have also included a new feature they call Nanopoint. The idea here is that, over an entire wafer, there are lots of “blips on the radar,” if you will. One or two of them may be of interest, but they can be overwhelmed by the other blips, which constitute noise. So they allow you to focus in on specific features that you might be concerned about. Perhaps an area where you had to compromise OPC, and you’re concerned that you might have compromised too much. This effectively masks out much of the wafer or die, giving you a stronger signal in the region of interest. All of this takes a fair bit of computing: they had to add cooling to the system because the computers were heating up the fab too much. Once you’ve figured out where the defects are likely to be found, the eDR-7100 can act as a review station for both unpatterned and patterned wafers. They’ve further automated bare-wafer review by adding an optical relocation module and an EDX feature: energy dispersion x-ray compositional analysis. (Which is probably why they simply say “EDX.”) This helps to smooth the process of taking defects identified in the detection systems and zeroing in and classifying them. For patterned wafers, they claim in particular to be able to identify defects at the bottom of high-aspect-ratio (HAR) features – trenches and fins. With the increasingly complicated materials stacks and 3D nature of devices, this has become an important capability. Also highlighted is the ability of the detection system and the review system to talk to each other. This relates largely to the precision of their stages. The detection system will identify a window of 0.5 µm, but they say that their competitors’ stages can resolve only around 2 µm. That means that, if mixing systems, the review system might completely miss the identified window. This is also important because the detection system can sometimes find things that a SEM has a hard time identifying. If the problem is simply looking at the wrong place, then the customer comes away thinking that the detection system is giving out false signals when in fact it’s the SEM system that can’t find it. Their message, of course, is that you should buy your detection and review stations from them rather than mixing and matching. One of the other choices, of course, would be a system from AMAT. In fact, KT acknowledges that AMAT has had the lead in review systems, although KT says that their position has improved from number 3 to number 2, just behind AMAT. And AMAT isn’t sitting still. They also announced a new review system, their SEMvision G6. They tout their resolution, the fact that they provide a 360° view, the ability to tilt their beam by 5-10° for looking between fins, back-scatter detection and filtering for HAR features, low-energy settings for litho and low-? layers, and high landing energy for seeing through multiple layers. Not all at the same time, of course. This illustrates the fact that different schemes are needed for seeing different things. But the thing they’re most focused on with this release is classification. For patterned wafers (recall that KT’s automated classification above was for blank wafers), they say that there is simply too much uncertainty and noise to be able to classify all defects automatically. So it has to be done manually, which would seem to be a chore. Instead of aiming for 100% automated classification, AMAT has gone the old 80/20 route: nail the 80% that are straightforward, meaning that the manual effort can then focus only on the remaining 20%. They’ve identified six categories that can be handled automatically: voids, residue, scratches, line thinning, particles, and bridging. The user can set the confidence level that the algorithms use – higher confidence means fewer automatically-classified defects, but, well, higher confidence that there are no mistakes. So if these guys were helping out our solitary beachcomber, you would say that the sensitivity and selectivity of the metal detector has been improved to find smaller items; that it can then radio in to a digger to automatically go to the spot of interest and pull out the little treasure and, for some of them – bottle caps and cans, for instance – automatically disposition them. The rest – the coins and bits of jewelry – are left for you to assay once you get home. KLA-Tencor and Applied Materials have announced new inspection line-ups. What are your wafer inspection challenges?